My name is Jason Yormark and I’m an introvert. There…I said it. I’m not ashamed. Why should I be? If there’s one thing I’ve learned over the years, is that being successful in life and business as an introvert isn’t any more or less challenging than if I were the opposite. But the perceptions I and those I’ve worked with don’t go unnoticed so I feel compelled to set the record straight. Let it begin! We don’t like to be around other people. Hey, I dig my me time. Cozying up on the couch to watch re-runs of Three’s Company, or just relax without having to deal with other people is good times. But that doesn’t mean I don’t enjoy being around others. Especially those in my inner circle…friends, family, co-workers…I need those interactions as well. I’m just not the guy that’s naturally great at sparking conversation in small intimate settings. However if you engage with me in one, I can be a great conversationalist. We don’t make good public speakers. Quite the contrary. While being an introvert, I love speaking opportunities. Love getting up in front of large groups of people to talk about things I’m passionate about. Ironically I’m great at this sort of thing, but not so much in small settings like networking events. Unfortunately I’m not smart enough to give you any sort of scientific reason for this sort of thing. So you’ll just have to go with me being an example. You’re welcome. We don’t make good leaders. Just because I’m not the life of the party doesn’t mean I’m incapable of leading others. My introverted nature usually has me praising others and putting them on the spot vs. putting the attention on me. It’s served me well in management roles, and being the kind of person that listens and digests information before speaking, it’s allowed me to make good decisions despite not coming off as the boisterous cheerleader. We don’t care. Often times introverts can come off as aloof, or uncaring. It’s simply not true. In most cases we’re listening intently…thinking, strategizing in our head the information we’re receiving to make thoughtful, efficient responses. Oh…we care. We’re plotting to take over the world. We need to strive to be less introverted. Being an introvert isn’t some sort of disease or condition. It’s not something that needs to be worked on or fixed…any more then someone who is extroverted needs to change their ways. Good managers, leaders, friends for that matter can recognize how people are wired, and work with them to develop relationships and work environments that embrace each person’s ways. Like anything in life, it’s about balance and meeting in the middle. I enjoy being around extroverts as much as I do introverts, and would never want to live in a world where everyone was wired the same way. Now leave me alone so I can go back to my show. 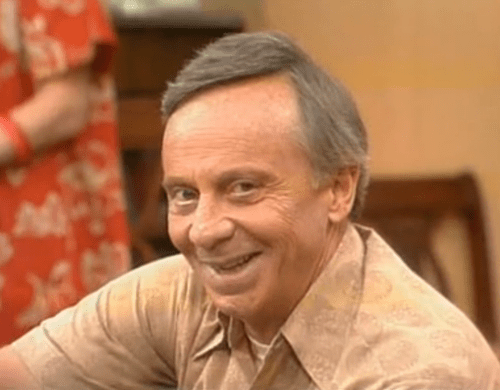 Mr. Roper is about to do his thing.